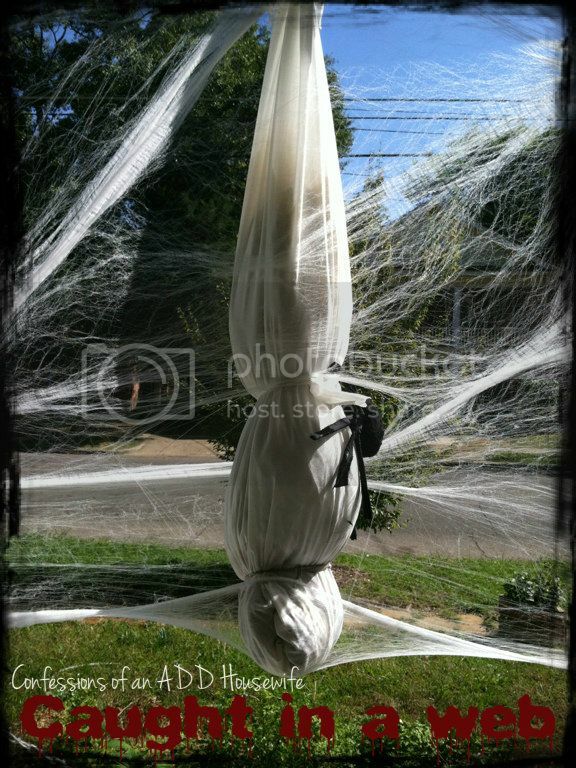 Halloween decorations are in full swing here! 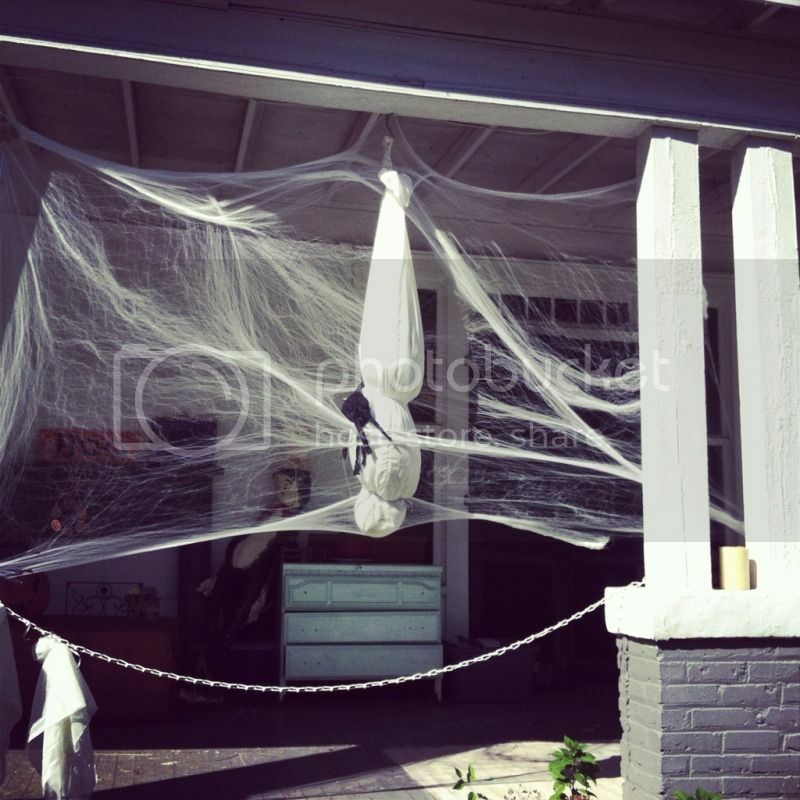 Many of the houses with big porches in our neighborhood and decorating with giant spiders and webbing. It makes some of the houses look even more creepy and haunted than usual. Making my cocoon was a cinch. I cut up a length of scrap fabric about 5 ft long and sewed up three of the four sides. Next, I began stuffing it with whatever I could find...tissue paper, grocery bags, scrap fabric...until it had some bulk. I used string to tie off the head area and another length to make the waist. The tricky part was really figuring out how to hang it on the one nail that was already there! I don't like climbing ladders on my rickety old porch. I had to use a coat hanger and pray I could reach! This creepy little guy was really easy to put together. 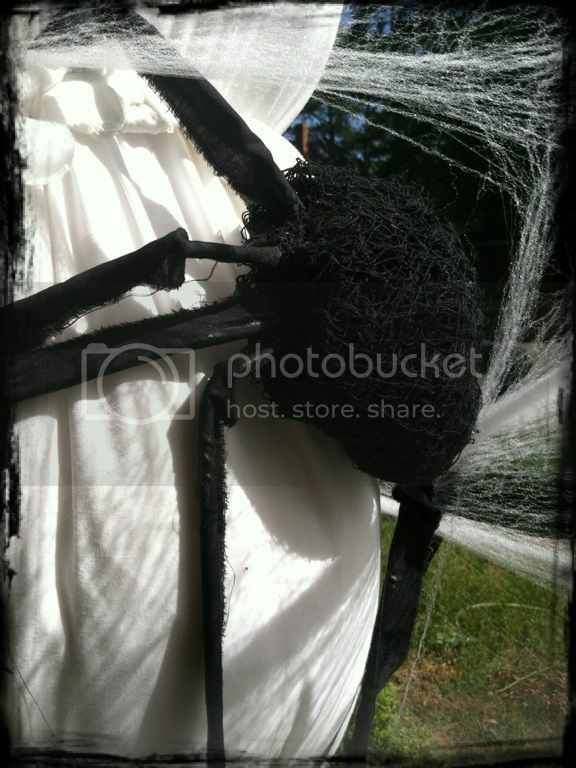 Its a ball of black Halloween mesh from the dollar store, black fabric and 8 bendy straws. Put him together by creating a big ball of black fabric. I had some left over from another project. Stretch out the bendy straws and cut a piece of black fabric a bit larger than the size of the straw. Using a hot glue gun, glue the straw into the fabric. I folded the fabric in half and glued the sides of the fabric together. This will make the legs look bigger and a bit hairier than if you wrapped the fabric around. The last step is to just glue the legs on. This is so awesome - SO CLEVER!!! I think I need to try to do this over the weekend, the kids would LOVE it! Thanks for the great Halloween share. I saw your post on FB. I pinned this to two boards :O) Have a great weekend! My Brilliant ALBFF ^_^ Amazing as ever! Oh my! What a fun idea!! Oh wow this is great super creepy too! Love it!! !